Give another try to a healthy Cauliflower – today I am preparing Cauliflower Salad that is a great refreshing lunch or can be served as a side – also at barbecue. 1. Combine sauce ingredients in a bowl, stir well until well blended. 2. Add califlower and cheese and mix until well covered with sauce. Posted in: Salads, Side Dishes. 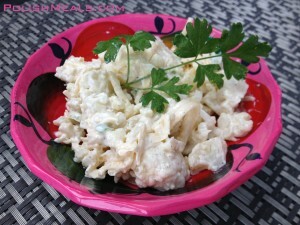 Tags: cauliflower, cheese, garlic, mayonnaise, olive, sour cream.